Some might wonder if nuoc mam (fish sauce) runs in the veins of Vietnamese people. Indeed it is almost synonymous with Vietnamese cuisine and is used as a flavoring agent, dipping sauce, and dressing for countless dishes. 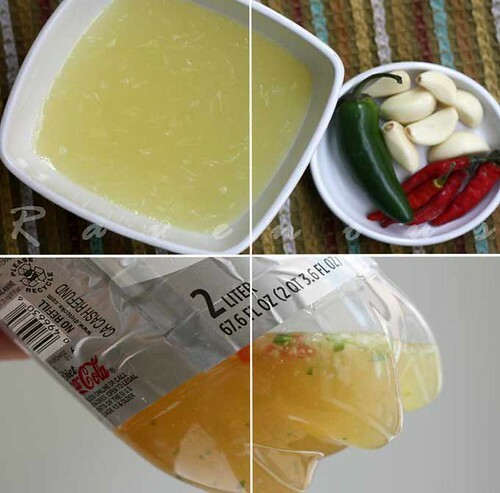 The basic components of dipping sauce are fish sauce, lime juice, water, crushed garlic, and chiles. There are numerous variations on the quantities as well as additions (such as ginger) but ultimately, it depends on your personal preference so feel free to experiment. Good idea to store nuoc mam in a 2 lt bottle? Find out below..
pickled carrots and daikon, optional. Add water and sugar to mix well to dissolve. You can heat the water up before hand to make it dissolve quickly. Add lime juice and vinegar (optional). It should taste like a very very bland lime-ade. If you have a morter, crush the garlic and chiles (if not, finely mince them) together and add to the mixture. Finally, slowly add the fish sauce a few tablespoons at a time instead of all at once. Taste frequently and stop when you feel it’s just right. It’s much easier to adjust the flavor of the dipping sauce by adding the fish sauce at the end bit by bit, adjusting to your personal taste. For a deeper red color, add some chile garlic sauce. You can also add pickled carrots and daikon into the nuoc mam cham as well. Coming from Vietnam, everything was valuable. Our parents didn’t want to part with anything and 2-L bottles were commonly used in our family to store large quantities of nuoc mam. One day, my cousin came home after a long day of grueling football practice looking for some ice cold soda to quench his thirst… he grabbed the first soda bottle in the fridge he saw and took a huge gulp, and immediately his eyes bulged, his mouth puckered, and out flew the nuoc mam with a scream of utter shock….you would think that my parents would be sympathetic, but no–he was strictly admonished for wasting a good bottle of nuoc man…. That's hilarious that your cousin accidentally drank fish sauce! 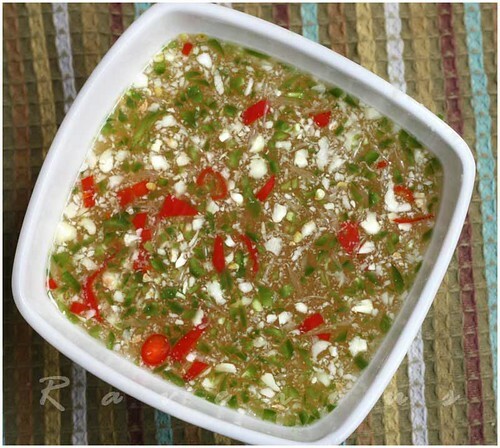 I did a post on nuoc mam awhile back too… it's my mom's recipe which she taught me. She also uses chili paste to give it the reddish color… here's the link http://thefoodaddicts.com/?p=174. btw, i'll be trying your nem nuong recipe soon! can't wait!!! I think one of my cousin drank fish sauce by accident, too. 😛 And oh yes, nuoc cham is so wonderful. Do you know that the Hanoian varies the flavours of nuoc cham a bit for different dishes? My 7-year-old daughter, who loves fish and soy sauce, took a dare from my brother to drink a tablespoon of fish sauce straight up. She did, and won $1. But two minutes later I hustled her into the bathroom where she had her first grown-up (into the toilet) vomit! And thank you for all the wonderful recipes including the still-beloved fish sauce! We visited Vietnam a few months ago and I came home craving the food even more than before. Hummingbird Appetite: It's happens more commonly than you think! Food addicts: Yup! Chili paste definitely gives it more color. We pretty much use whatever chili we have on hand. Anh: We love all the variations of nuoc mam…esp nuoc mam gung (ginger)…can't get enough of that eating bun mang vit! holy smokes!!! 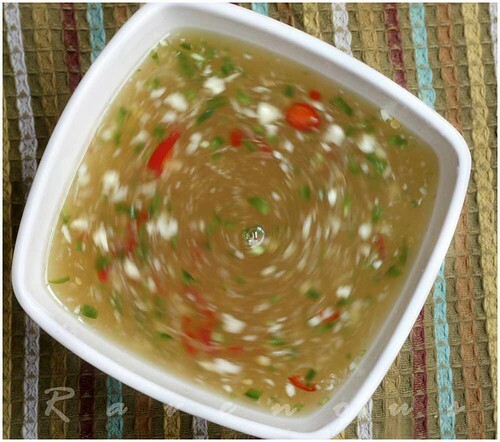 Look at the swirling Nuoc Mam, GREAT picture! Starred at it for so long I got dizzy. houstonwok: Glad someone noticed the hypnotizing artistry on that shot! Thanks! This sauce is awesome but my question is how long and where to store the 2L bottle. I remember always pounding the garlic and pepper and sugar together in a mortar then adding lime, then water, then finally the fish sauce. All the flavors seemed to meld better that way, rather than with chopped garlic. anonymous: every family has their way of making nuoc mam–you're absolutely right, using a morter and pestle would add more flavor. And hey, not just HoustonWok, I saw the swirling of sauce, too! Very creative. wow! 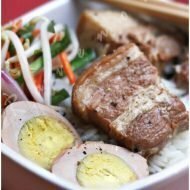 i'm so glad i found your blog..
it's just what i've been looking for to make some of these amazing vietnamese recipes! it will be nice to be able to see the name with the picture. the only vietnamese i know is the name of my favorite dishes..
and, please post a recipe for banh beo… that would be amazing! A late answer to anonymous:This sauce is awesome but my question is how long and where to store the 2L bottle. I discovered some in the pantry a couple years old. I gave it a try and it was just fine. So Nuoc mam and twinkies never expire. This is the best asian cooiking blog ever ! Ed: Nuoc mam is Vietnamese gold, another similarity to the color of twinkies Thank you so much for your kind words! I'm thrilled to have stumbled upon your blog. I'll be making spring rolls and this dipping sauce this week for a dinner party! Thanks! kasey: thanks for visiting our blog..have a great time with all the cooking and do let us know how things turn out! Thank you very much for your fantastic recipes. I've been especially looking for a good recipe for thit nuong, and yours is really great. What a very cool fish sauce this is. It is really different from the usual fish sauces at home. Is this the same dipping sauce they use at Vietnamese restaurants for grilled pork? thanks so much and like us on Facebook to post your photos! Great post about nuoc mam cham! I feel so bad for you cousin for drinking it, what a shock! Bad enough just taking a sip of water only to find out it’s Sprite. Anyway, I mentioned your blog in my post about spring rolls Here’s the link if you are interested: http://cheesewithnoodles.blogspot.com/2012/05/fresh-spring-rolls-with-tofu-and-nuoc.html Going to go check out the rest of your blog! I totally happened to me when I was a kid!! My brothers and I were playing and came inside for a cool refreshing drink. My mom had stored homemade dish sauce in a Coca-Cola bottle. Being a greedy person I snatched the bottle out of brother’s hand and took a giant swig…. OMG! I just made your yummy sauce and that’s the first thing I thought of AND said!!! I am not Vietnamese — thank you for letting me pretend that I am. I am in love with Vietnamese food. 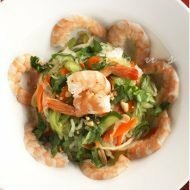 This is the best nuoc mam cham recipe ever! I am not Vietnames but have had the pleasure of trying authentic Vietnamese food in Hanoi and this is truly authentic! Thank you for sharing. Hey, how long can u keep the sauce for once its made..? How long will nuoc mam pha last in the fridge? Sorry I just saw Alex’s comment…don’t mind me…love your website! Hello! 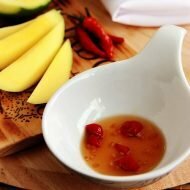 Do you know what dipping salt people use with mangoes? My friends cut some for us and used a dipping salt, but I don’t know what it is or where to buy it. Thanks! for green sour mango it’s fish sauce, sugar and red chili. try 1:1 ratio of fish sauce and sugar. otherwise it’s salt and crushed chilis.